How To Make A Cinnamon And Cardamon Flan. Hope you’re having fun-filled weekend!? Are you planning something nice over the weekend? Not sure what we are up to yet. We are always rushing around at last minute making plans. We are making plans around the weather so we could be going anywhere. Indoors or outdoors!? The weather is so changeable at the minute. 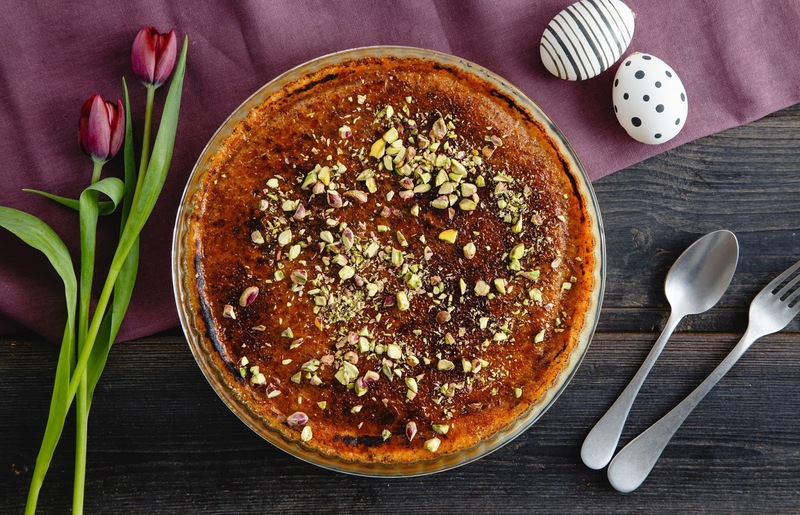 Today I am sharing this Cinnamon And Cardamon Flan for an Easter treat. This flan has cinnamon in it to taste (I love anything with cinnamon in it). Everything smells amazing when cooking with cinnamon in. Also topped with pistachios. How yummy!! Crush the cardamom pods gently and remove the dark seeds to crush to a fine powder. Add all the ingredients together and mix well, making sure the egg is beaten up. Pour into a Pyrex glass flan dish and bake at 150°C for 40 minutes. The flan is baked when the centre reaches 74°C. Using a blowtorch, caramelise the sugar to give a crispy crackling surface without cooking the flan. Sprinkle over chopped pistachios to finish. Do you fancy making this cinnamon And cardamon flan? Do you like the smell of cinnamon cooking too? Now off to plan some fun for over the next few days. Do you leave planning to the last minute like me or are you super organised? How cool a 4 day weekend!! Have fun. What about making some of these Ginger and chocolate pot? If you’re avoiding takeaways at all cost but still find you’re getting the Friday evening cravings, these fake-away recipes from Pyrex are a must try! Fake-Away recipes to keep you on track. Fancy making some Challah bread over Easter? How To Make Challah Bread. "A Walk In The Woods With Mini Me And Mollie The Collie"
I've never had a flan! But this sounds so good! :)I would love for you to share this with my Facebook Group for recipes, crafts, tips, and tricks: https://www.facebook.com/groups/pluckyrecipescraftstips/Thanks for joining Cooking and Crafting with J & J!